What do the Terminal menu item icons under Window mean? 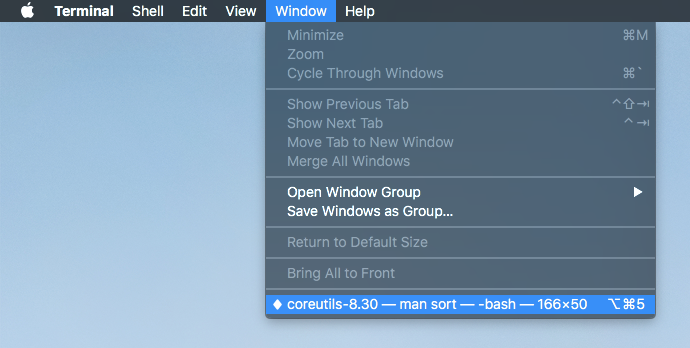 Where is terminal app window menu symbology documented as I can't find out what the icons to the left of the existing terminals open under the Window menu mean. I understand the check mark is the current window in the foreground, but what does the dot mean? A diamond (♦︎) means the window is minimized (as user3439894 said in their answer). But a dot (•) means the window is "dirty" — that is, it can't be closed without potentially losing something. An app will typically ask for confirmation before closing a dirty window. These conventions apply across macOS's UI, not just Terminal. For Terminal, dirty means that there's a program running in the shell, other than the ones listed as safe in Preferences > Profiles pane > Shell tab > Ask before closing. The diamond icon, (AXMenuItemMarkChar ◆), to the left of the window name in Terminal's Window menu shows that the window is minimized. Not the answer you're looking for? Browse other questions tagged macos terminal menu-bar . How to make terminals open side-by-side? How do you access network preferences from the Terminal? How can I figure out what's opening a Terminal window whenever I log in? What does shell_session_history_check do in the default PROMPT_COMMAND? Where in the filesystem is the “New Terminal Tab at Folder” service?